Here’s the JT LeRoy Author Page on Amazon. This catalog documents Terminal 5, a group show held at Eero Saarinen’s TWA Terminal at New York’s JFK Airport, to which JT LeRoy contributed. JT’s articles for New York Press include “Pillow Lips: My Dinner with Gus Van Sant & Mike Pitt,” excerpts from Sarah and The Heart Is Deceitful Above All Things, and interviews with Suzanne Vega, Dorothy Allison, Penelope Spheeris, Coldplay, Mary Karr, Joe Strummer, Mick Rock, and others. 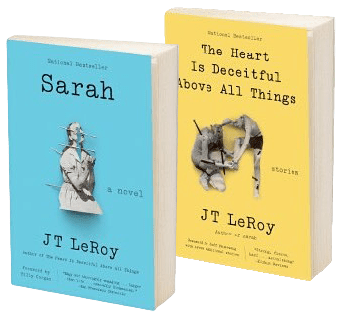 Among JT’s writings for nerve.com are “Tree House,” “Blue Christmas,” “Straight Expectations,” an interview with Mike Pitt, and excerpts from Sarah and The Heart Is Deceitful Above All Things. JT’s special friendship with Mike Pitt is celebrated here. David Grohl (Nirvana, Foo Fighters) is interviewed by JT for The Face. Asia Argento talks to JT about adapting The Heart Is Deceitful Above All Things into a film. JT interviews filmmaker Paul Devlin about his documentary Power Trip.